If you are looking for an insight into the benign tumours of larynx, then this sqadia medical video lecture is for you. 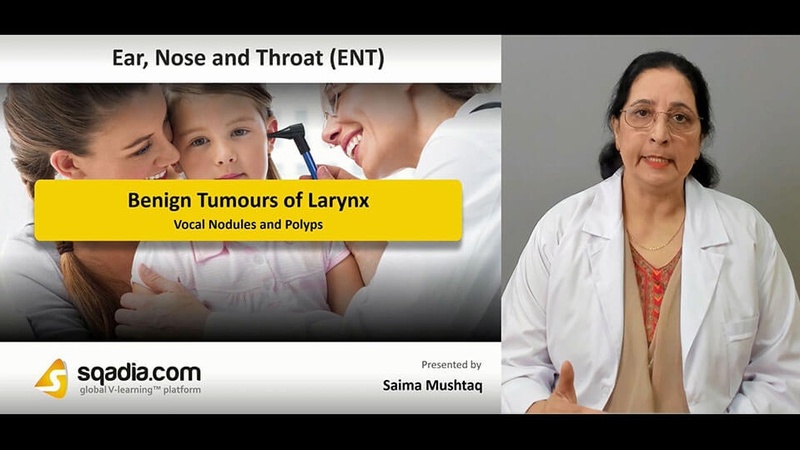 Our medical specialist, Dr Saima Mushtaq expansively elucidates about the various types of non-neoplastic and neoplastic laryngeal tumours. Amongst the former category, Reinke’s oedema, leukoplakia, granulomas, amyloid tumours, vocal nodules and polyps have been discussed. Cystic lesions have also been elaborated. On the contrary, chondroma, types of haemangioma, granular and glandular tumours have also been comprehensively explained. In addition to that, types of squamous papillomas viz juvenile papillomatosis and adult-onset papilloma have been talked about. Benign tumors of laryngeal structure include both neoplastic and non-neoplastic cancers. Non-neoplastic tumors are not true neoplasms and occur owing to any infection, trauma or degeneration. These include solid non-neoplastic lesions. Additionally, Reinke’s oedema, contact ulcer or granuloma and intubation granuloma have been comprehensively elaborated. Leukoplakia or keratosis and amyloid tumors have also been shed light upon along with their diagnosis and treatment. 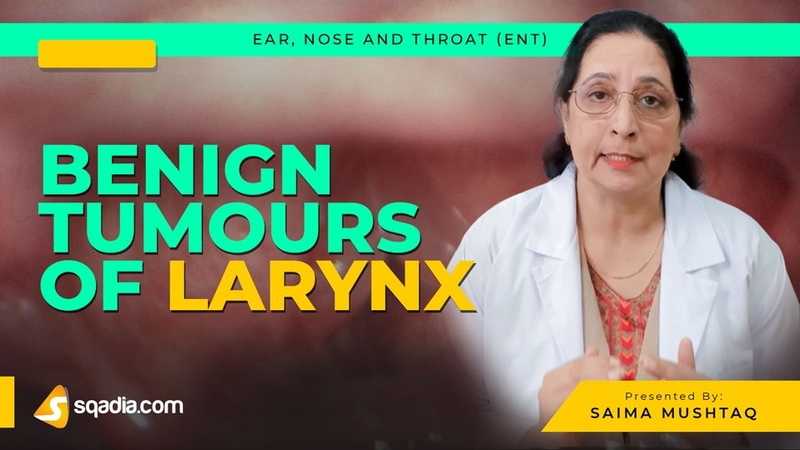 Vocal nodules are also termed as Singer’s or Screamer’s nodes. In this condition, vocal cord epithelium undergoes hyperplasia and this medical condition presents with characteristics features. On the other hand, vocal polyp has also been explained alongside its symptoms. Treatment options for polyps include surgical excision or the speech therapy. Cystic lesions have been expansively been talked about in this section. Three major types of cystic lesions are ductal, saccular cysts and laryngocele. The former type are the retention cysts. Whereas, the saccular cysts can either be anterior saccular or lateral saccular cysts. Laryngocele, on the other hand, can either occur internally, externally or combined/mixed type. It can be treated either surgically or via laryngoscopy. Dr Saima Mushtaq has explained about neoplastic lesions in this section. Under the category of neoplastic tumours, chondroma, infantile and adult haemangioma have been delineated. In addition to this, granular cell tumour, glandular tumours and rare benign laryngeal tumors have also been shed light upon. Squamous papillomas include two general categories named juvenile papillomatosis and adult-onset papilloma. Diagnosis of the former can be carried out via flexible fibreoptic or direct laryngoscopy along with biopsy. However, the treatment options include CO2 laser excision and microlaryngoscopy. Whereas, the latter category arises from the anterior commissure or anterior half of vocal cord.